Since rif and I have been frequenting the same Char Kway Teow places in Penang, we decided to try the famous CKT at Lorong Selamat instead. We each asked for a big plate with prawns, and were told to wait for 40 minutes. o_0 (I was thinking to myself, “SO NICE MEH?? 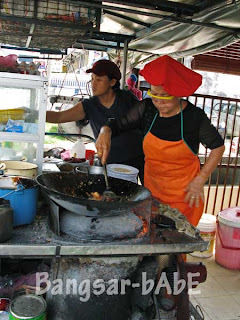 Until must wait THAT long…) Well…the Char Kway Teow was absolutely scrumptious! The prawns were very fresh, big and bursty. The crispy pieces of lard were well distributed and there were also bits of crushed up lard. *Yay! 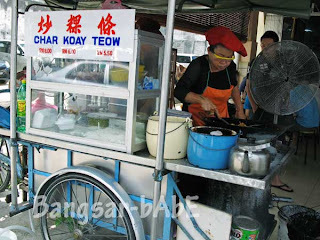 * Thin, slightly crisped Lap Cheong (chinese sausage), juicy cockles, egg and chives – it was THE ultimate plate of char kway teow. The taste hits you and it lingers on in the mouth. Look at those GINORMOUS prawns! Shiokness I-Tell-You! 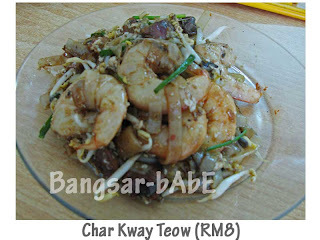 Undisputedly, this was the best Char Kway Teow I’ve had in Penang (and everywhere else)! And it’s cooked with COAL fire! Of course, such a plate came with a price tag befitting it’s status. Be prepared to part with RM8 for a plate. Such big prawns of course cost da bomb. Yeah…but the “big” portion wasn’t that big. Only the prawns were big. Even so, I still think the price tag was rather hefty. Heard good and bad reviews about this place but still, am curious and need to find it out myself on my next trip to penang. Prob is, i am an impatient person.